Retterstøl, Kjetil Svendsen, Mette Narverud, Ingunn and Holven, Kirsten B. 2018. Effect of low carbohydrate high fat diet on LDL cholesterol and gene expression in normal-weight, young adults: A randomized controlled study. Atherosclerosis, Vol. 279, Issue. , p. 52. Ulven, Stine M. Leder, Lena Elind, Elisabeth Ottestad, Inger Christensen, Jacob J. Telle-Hansen, Vibeke H. Skjetne, Anne J. Raael, Ellen Sheikh, Navida A. Holck, Marianne Torvik, Kristin Lamglait, Amandine Thyholt, Kari Byfuglien, Marte G. Granlund, Linda Andersen, Lene F. and Holven, Kirsten B. 2016. Exchanging a few commercial, regularly consumed food items with improved fat quality reduces total cholesterol and LDL-cholesterol: a double-blind, randomised controlled trial. British Journal of Nutrition, Vol. 116, Issue. 08, p. 1383. Holme, I. Retterstøl, K. Norum, K. R. and Hjermann, I. 2016. Lifelong benefits on myocardial infarction mortality: 40-year follow-up of the randomized Oslo diet and antismoking study. Journal of Internal Medicine, Vol. 280, Issue. 2, p. 221.
van Hooijdonk, Toon and Hettinga, Kasper 2015. Dairy in a sustainable diet: a question of balance. Nutrition Reviews, Vol. 73, Issue. suppl 1, p. 48. Delgado-Pando, Gonzalo Celada, Paloma Sánchez-Muniz, Francisco J. Jiménez-Colmenero, Francisco and Olmedilla-Alonso, Begoña 2014. Effects of improved fat content of frankfurters and pâtés on lipid and lipoprotein profile of volunteers at increased cardiovascular risk: a placebo-controlled study. European Journal of Nutrition, Vol. 53, Issue. 1, p. 83. Simons, Luuk P. A. Hampe, J. Felix and Guldemond, Nick A. 2013. Designing healthy living support: mobile applications added to hybrid (e)Coach solution. Health and Technology, Vol. 3, Issue. 1, p. 85. Hoenselaar, Robert 2012. The importance of reducing SFA intake to limit CHD risk. British Journal of Nutrition, Vol. 107, Issue. 03, p. 450. Pedersen, Jan I. Norum, Kaare R. James, Philip T. Brouwer, Ingeborg A. Katan, Martijn B. Clarke, Robert Elmadfa, Ibrahim Kris-Etherton, Penny M. Kromhout, Daan Margetts, Barrie M. Mensink, Ronald P. Rayner, Mike and Uusitupa, Matti 2012. Response to Hoenselaar from Pedersen et al.. British Journal of Nutrition, Vol. 107, Issue. 03, p. 452. Ravnskov, Uffe Diamond, David Canan Efendigil Karatay, M. Miller, Donald W. and Okuyama, Harumi 2012. 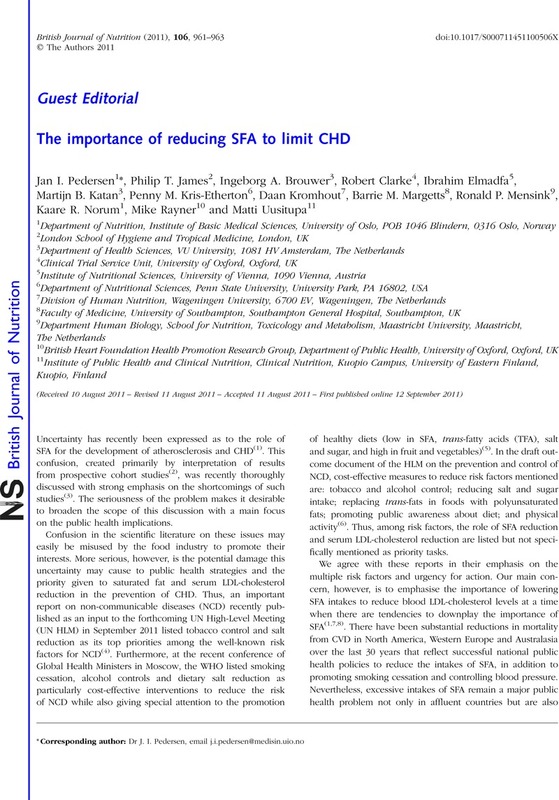 No scientific support for linking dietary saturated fat to CHD. British Journal of Nutrition, Vol. 107, Issue. 03, p. 455. Maki, Kevin C. Van Elswyk, Mary E. Alexander, Dominik D. Rains, Tia M. Sohn, Eugenia L. and McNeill, Shalene 2012. A meta-analysis of randomized controlled trials that compare the lipid effects of beef versus poultry and/or fish consumption. Journal of Clinical Lipidology, Vol. 6, Issue. 4, p. 352. 1 Siri-Tarino, PW, Sun, Q, Hu, FB, et al. (2010) Saturated fat, carbohydrate, and cardiovascular disease. Am J Clin Nutr 91, 502–509. 2 Siri-Tarino, PW, Sun, Q, Hu, FB, et al. (2010) Meta-analysis of prospective cohort studies evaluating the association of saturated fat with cardiovascular disease. Am J Clin Nutr 91, 535–546. 3 Kromhout, D, Geleijnse, JM, Menotti, A, et al. (2011) The confusion about dietary fatty acids recommendations for CHD prevention. Br J Nutr 106, 627–632. 4 Beaglehole, R, Bonita, R, Adams, C, et al. (2011) Priority actions for the non-communicable disease crisis. Lancet 378, 566–567. 5 World Health Organization (2011) http://www.who.int/nmh/events/moscow_ncds_2011/conference_documents/en/. 6 World Health Organization (2011) http://www.ncdalliance.org/resources/speeches. 7 Micha, R & Mozaffarian, D (2010) Saturated fat and cardiometabolic risk factors, coronary heart disease, stroke, and diabetes: a fresh look at the evidence. Lipids 45, 893–905. 8 Astrup, A, Dyerberg, J, Elwood, P, et al. (2010) The role of reducing intakes of saturated fat in the prevention of cardiovascular disease: where does the evidence stand in 2010? Am J Clin Nutr 93, 684–688. 9 Mozaffarian, D, Micha, R & Wallace, S (2010) Effects on coronary heart disease of increasing polyunsaturated fat in place of saturated fat: a systematic review and meta-analysis of randomized controlled trials. PLoS Med 7, e1000252. 10 Campbell, TC, Parpia, B & Chen, J (1998) Diet, lifestyle, and the etiology of coronary artery disease: the Cornell China study. Am J Cardiol 82, 18T–21T. 11 Campbell, TC & Chen, J (1999) Energy balance: interpretation of data from rural China. Toxicol Sci 52, Suppl. 2, 87–94. 12 Stamler, J (2010) Diet-heart: a problematic revisit. Am J Clin Nutr 91, 497–499. 13 Scarborough, P, Rayner, M, van Dis, I, et al. (2010) Meta-analysis of effect of saturated fat intake on cardiovascular disease: over adjustment obscures true associations. Am J Clin Nutr 92, 458–459. 14 Katan, MB, Brouwer, IA, Clarke, R, et al. (2010) Saturated fat and heart disease. Am J Clin Nutr 92, 459–460. 15 Fewell, Z, Davey Smith, G & Sterne, JA (2007) The impact of residual and unmeasured confounding in epidemiologic studies: a simulation study. Am J Epidemiol 166, 646–655. 16 Mozaffarian, D, Aro, D & Willett, WC (2009) Health effects of trans-fatty acids: experimental and observational evidence. Eur J Clin Nutr 63, S5–S21. 17 Stender, S & Dyerberg, J (2004) Influence of trans fatty acids on health. Ann Nutr Metab 48, 61–66. 18 Glass, CK & Witztum, JL (2001) Atherosclerosis: the road ahead. Cell 104, 503–516. 19 Tabas, I, Williams, KJ & Borén, J (2007) Subendothelial lipoprotein retention as the initiating process in atherosclerosis. Update and therapeutic implications. Circulation 116, 1832–1844. 20 Emerging Risk Factors Collaboration Kaptoge, S, Di Angelantonio, E, et al. (2010) C-reactive protein concentration and risk of coronary heart disease, stroke, and mortality: an individual participant meta-analysis. Lancet 375, 132–140. 21 Mensink, RP, Zock, PL, Kester, ADM, et al. (2003) Effects of dietary fatty acids and carbohydrates on the ratio of serum total to HDL cholesterol and on serum lipids and apolipoproteins: a meta-analysis of 60 controlled trials. Am J Clin Nutr 77, 1146–1155. 22 Ford, ES & Capewell, S (2011) Proportion of the decline in cardiovascular mortality disease due to prevention versus treatment: public health versus clinical care. Annu Rev Public Health 32, 5–22. 23 Laatikainen, T, Critchley, J, Vartiainen, E, et al. (2005) Explaining the decline in coronary heart disease mortality in Finland between 1982 and 1997. Am J Epidemiol 162, 764–773. 24 Vartiainen, E, Laatikainen, T, Peltonen, M, et al. (2010) Thirty-five-year trends in cardiovascular risk factors in Finland. Int J Epidemiol 39, 504–518. 25 Valsta, LM, Tapanainen, H, Sundvall, J, et al. (2010) Explaining the 25-year decline of serum cholesterol by dietary changes and use of lipid-lowering medication in Finland. Public Health Nutr 13, 932–938. 26 Pedersen, JI, Tverdal, A & Kirkhus, B (2004) Diet changes and the rise and fall of cardiovascular disease mortality in Norway. Tidsskr Nor Laegeforen 124, 1532–1536. 27 Aspelund, T, Gudnason, V, Magnusdottir, BT, et al. (2010) Analysing the large decline in coronary heart disease mortality in the icelandic population aged 25–74 between the years 1981 and 2006. PLoS ONE 5, e13957.